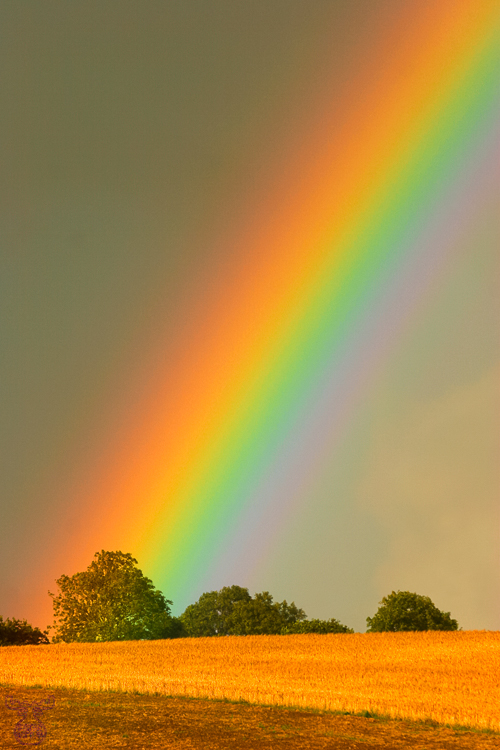 Many different myths have developped around the colourful rainbow. One of them, which I remember from my boyhood, is the pot of gold, which can be found at the ends of the rainbow. We didn't find gold, when we visited Ireland this year. But the rainbow itself, one of three we saw during our holiday roundtrip travelling the coast of Ireland, was so bright and intensive in colour, that it was award enough. The whole story occured after a heavy, but very short rain shower, which had driven us out of the cemetary of the monastery of Monasterboice. We ran back to the car-park to prevent our gear getting (too) wet. Just a minute after entering the car, we saw the rainbow just in front of us. After some exiting glances and cleaning the frontglass of my lens from raindrops, I took these pictures showing this rainbow in a luminance I never had seen any before.It's a moment of adrenaline you don't want to miss and - a photographer's fortune - must keep on film, sorry, flashcard.